\(x^2+y^2=4\) centered at the origin of the \(x\)-axis, if\(P\) is the coordinate point \((4,0)\), and if \(d\) represents the distance between \((x,y)\) and \(P\) then, using only calculus, we can prove what point \((x,y)\) on the circle is associated with a minimum value of \(d\). Visually speaking, this problem is pretty obvious; clearly \(d\) is smallest when \((x,y)=(2,0)\). 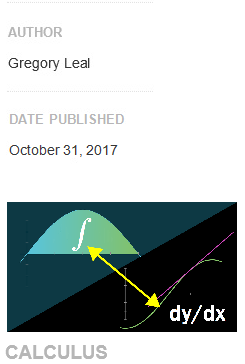 But in this lesson, we'll prove this statement using only calculus—more specifically, using only the calculus techniques we learned in the lesson, Finding the Minima and Maxima of a Function. Figure 1: A graph of the circle \(x^2+y^2=4\) which is centered at the origin of the \(x\)-axis. If \((x,y)\) represents any point on the circle, if \(P\) is a point fixed at the coordinate point \((4,0)\), and if \(d\) represents the distance between those two points then, by using only calculus, we can find the point \((x,y)\) on the circle associated with the minimum distance \(d\). In Figure 1, I have drawn a graph of a circle of radius \(r=2\) centered at the origin of an \(xy\)-plane. I have also drawn a point \(P\) at the coordinate point \((4,0)\). If we let \((x,y)\) be any point on the circle and if \(d\) is defined as the distance between the two points \((x,y)\) and \(P\), then our problem is to find the coordinate point \((x,y)\) on the circle for which the distance \(d\) is minimized by using the techniques we developed in previous lessons for finding the minima of a function. The solution to this problem is pretty obvious: clearly the point \((2,0)\) on the circle is associated with the minimum value of \(d\) which is given by \(d=2\). But let's determine the solution using only the calculus techniques we developed in previous lessons to check to see if these techniques actually work and lead to correct results. Thus, using only the techniques of calculus, we have proved that the minimum distance \(d\) between the point \(P\) and any point \((x,y)\) on the circle \(x^2+y^2=4\) occurs at the point \((2,0)\).